The Ayatollah of Rock ‘n’ Rolla’s band Fozzy have never quite managed to break through to the mainstream despite having one of the WWE’s biggest stars at its helm. Sometimes this level of stardom is enough to propel a band to the big leagues regardless of talent. 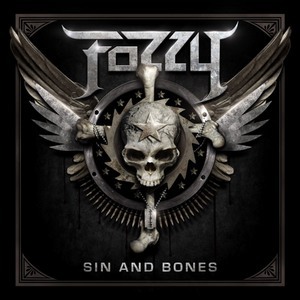 With ‘Sin And Bones’ Fozzy ought to leap frog many of their contemporaries thanks to the quality old school riffs and chest-beating choruses. ‘Sin And Bones’ treads a line between the old and the new – the most notable influences are Iron Maiden and Avenged Sevenfold, two of the greats who continue to release critically acclaimed works. The epic chorus of ‘Spider In My Mouth’ and the swagger of ‘Sandpaper’ which features M Shadows from the latter band belong in any true rock ‘n’ roll fan’s library. There’s a little experimentation here and there – ‘Blood Happens’ turns the heavy factor up to 11 with its growled vocals, blast beats and frenetic soloing. Title track ‘Sin And Bones’ hits hard and fast with punk influenced drumming and an arena-sized hook. The real gems are the longer tracks. At over 7 minutes, ‘A Passed Life’ is a majestic ballad that has space to grow and develop. Jericho’s vocals show signs of just how tight that ring attire has been for all those years, reaching some of the highest notes of the album, while the extended outro lets the band’s rhythm section shine. Even better is the 12 minute ‘Storm the Beaches.’ From the piano intro to the hushed conclusion, its unsurprisingly war-laced lyrics take you on a journey over the top. Structurally it is reminiscent of latter-day Iron Maiden, and is no less grand than that band’s most bombastic moments. With the most memorable chorus on the album and the way that those 12 minutes pass in what feels like half that time, ‘Storm the Beaches’ is the clear standout. Elsewhere you’ll hear influences by 80s hair metal, Jericho’s cocksure persona, and fist-raising anthems. In a year that has been plagued by artists losing focus of what rock ‘n’ roll is actually about, Fozzy’s ‘Sin and Bones’ is a breath of heavy metal air to sink your teeth and horns into.